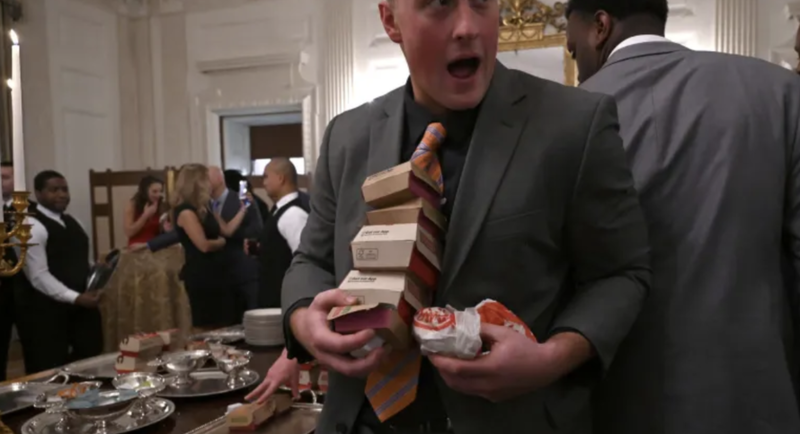 So President Trump came up with an alternative: He ordered, and personally paid for thousands of dollars in McDonald's, Burger King, Wendy's and Dominoes, then invited the Clemson Tigers to toss aside their nutritionist-inspired inhibitions and dig in to a fast-food feast served in silver White House trays. 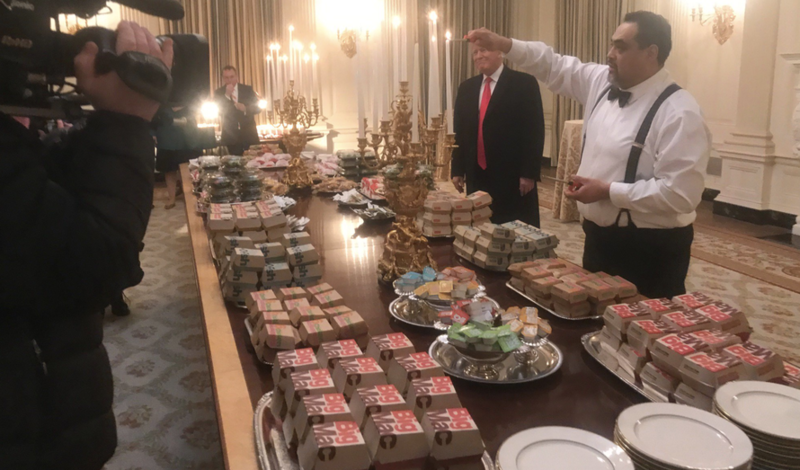 One table was covered in trays of various fast-food burgers, while another was slathered in pizza and fries. Images from the dinner swiftly went viral late Monday. Asked whether he preferred McDonald's or Wendy;'s, Trump insisted that "I like it all" and that "it's "great American food." "I like it all. I like it all," Trump said. "It’s all good stuff, great American food." 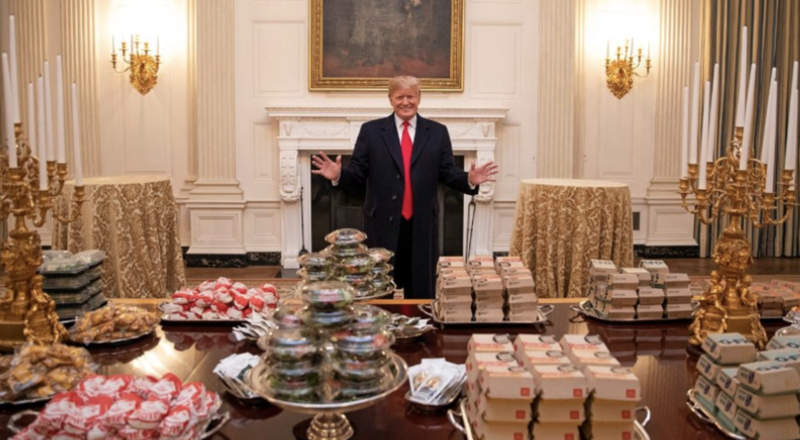 Trump added that he had ordered more than 300 burgers had been bought for the dinner. 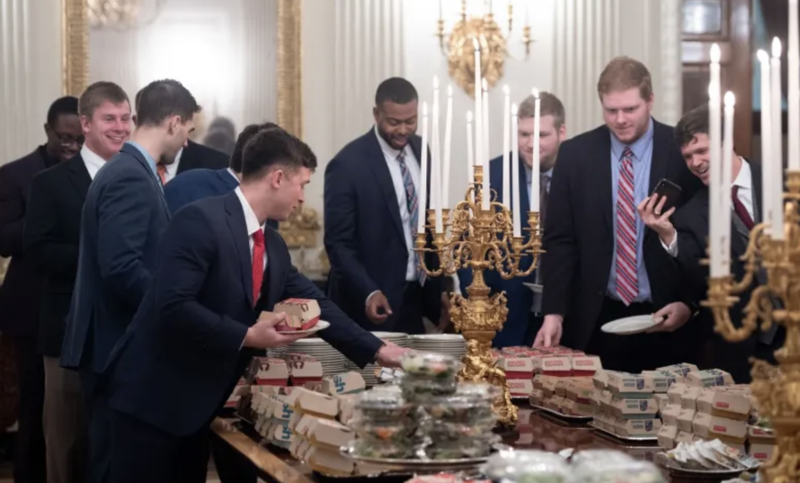 During remarks to the players, Trump congratulated the team on its victory, and joked that he'd rather feed them burgers than salads prepared by the First Lady. One reporter at the event said the players "whooped" when they saw the food. Sarah Huckabee Sanders confirmed that Trump had paid for the feast and the caterers. 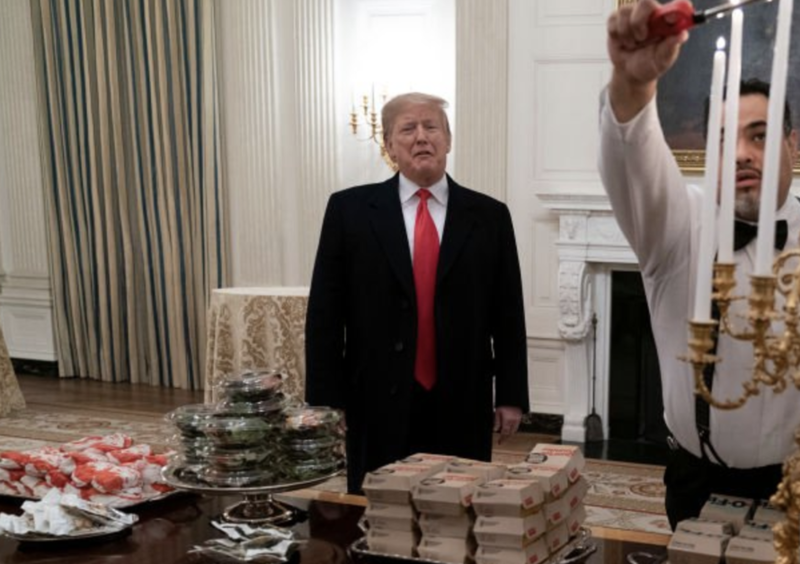 "[M]uch of the residence staff at the White House is furloughed - so the President is personally paying for the event to be catered with some of everyone’s favorite fast foods," White House press secretary Sarah Sanders said. The images prompted a range of reactions on twitter from amusement to abject horror. Ahead of the dinner, Trump told one reporter that he really thought the meal "will be interesting". "The Clemson national championship team will be coming tonight. It will be exciting. Very great team. Unbelievable team. I think we're going to serve McDonalds, Wendys, and Burger King...some pizza. I really mean it. Their favorite food. So we'll see what happens"
"I would think that' their favorite food."